I don’t remember this extremely well. Was it Steve who came to me, or me who went to Steve, asking for one more tiny Melonpool crossover moment? The Steel Duck had a big cannon thing at the time, and Steve was in the middle of his own Big Action Event. I do remember Steve reminding me that the gun thinger on the Duck was no longer bent and pointing towards the bridge of the ship. 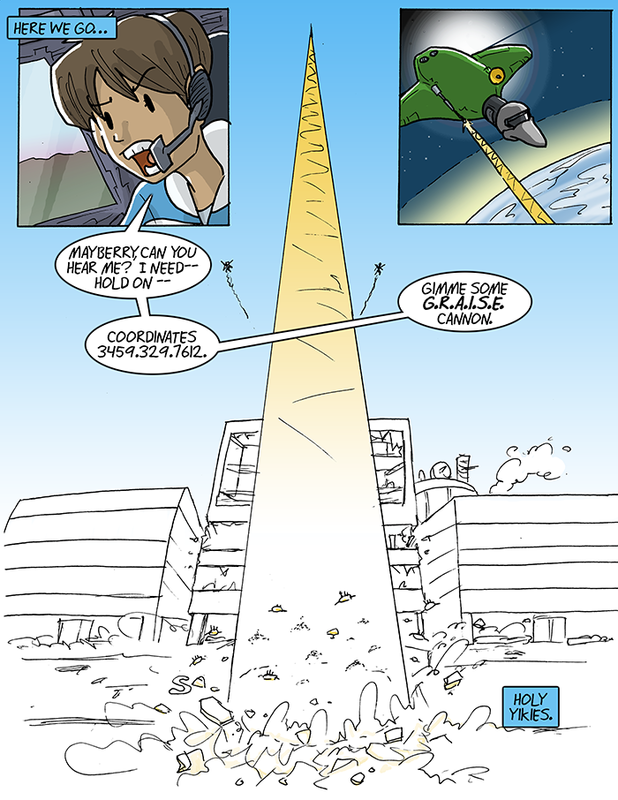 (which is good) And so here we are, compiling giant space-to-earth cannons from another webcomic on top of the giant robots we introduced literally yesterday. No U.S. military was harmed in the blast, we swear. Well, the Melonpool archive is there, it’s just paywalled. This was definitely more out of left field than the robots that came almost out of nowhere… Wait on second thought this probably has a better foreshadowing than the robots since they actually had a few crossover strips as reference while the robots are just there. There’s about to be a really hot demand for cannon fodder, for one thing. Soooo much cannon fodder. I am reminded of how all of the giant monster fights in Power Rangers would conveniently take place in the abandoned warehouse district. I read it as graze as it it only grazed them instead of any real damage. It’s been a while since I read Melonpool, but IIRC, the G.R.A.I.S.E. are the “Grays”, as in the type of aliens. The dudes X-COM calls the Sectoids. I completely forgot about this strip. I was definitely expecting a different strip that I guess happens later with Walky and Joyce and their giant robots. What I remember best about this sequences was the immediate follow-up strip over at Melonpool.